If you reside in the Oakland area and are interested in receiving gynecological and obstetrical care from our doctors, please contact our office to set up an appointment. For additional information about the services we offer and to learn more about our practice, please continue reading below. Head SW on Broadway toward 14th St. Turn right onto 14th St. Then turn right onto Castro St. Slight left onto CA-24 ramp to Walnut Creek/San Francisco/Hayward. Merge onto I-980E. Take the exit toward San Francisco. Merge onto I-580W. Take the exit on the left to I-80W toward San Francisco. Keep right at the fork. Follow signs for US-101N. Continue onto Octavia Blvd. Turn left onto Fell St. Take the third right onto Webster St. Slight left to stay on Webster St.
Destination with be on the right. 2100 Webster St. Suite 319. San Francisco, CA. 94115. Since 1985 PGOMG’s goal has been to provide the highest quality of medical care possible throughout our community. We strive to give each and every patient individual attention in a gentle and compassionate manner. PGOMG offers comprehensive care for your Gynecological and Obstetrical needs. We aim to empower our patients to make informed decisions about their health and offer complete evaluation of their conditions. Our Providers are a dedicated group of board certified OBGYN specialists who care about our patients in the Oakland area. Our staff and physicians come from diverse backgrounds, and all of our physicians are board certified by the American Board of Obstetrics and Gynecology. 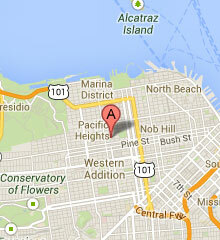 Our 7 physicians make up one of the largest, most experienced private practices in the San Francisco Bay Area. Our care providers are leaders in gynecological and obstetrical care in the Oakland area. PGOMG’s gynecological services include annual well women exams, contraception, STD screenings, and diagnoses and treatment for a range of gynecological conditions, including minimally invasive surgeries. For a full list of gynecological service, please visit here. Our obstetrical care services include preconception counseling, high risk OB management, in-office ultra sound, and pregnancy options. For a full list of obstetrical services, please visit here. To see a comprehensive list of the services we provide please visit our care page. To read testimonials and see ratings from our patients including those from Palo Alto, please visit our read our review page.